The catch? The box got a little banged up. Check it out! Salter 125 Retro Food Scale - Open Box. Container Size 8.5" x 6.5" x 2.75"
Scale Size 7" x 6.5" x 4"
Compact, Dust Free Storage When you're not using this food scale, just stick it in its weighing container. This will save you a lot of counter space, and keep dirt and dust from resting in the weighing bowl. 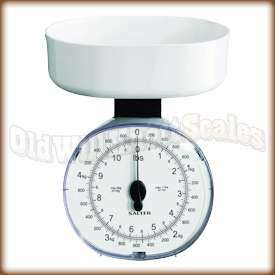 Large Weighing Bowl, Great For Recipes! If you're having a tough time getting consistent recipes, you should try weighing out each ingredient with this Salter kitchen scale. When ya weigh what you're putting into your mixes, you have a better chance of your recipes coming out the same each time. And the best part is...no more measuring cups! Just weigh your ingredient, set the scale back to zero, and weigh the next! This kitchen scale can handle up to eleven pounds of ingredients. Dual Reading Dial Doesn't it get on your nerves when one recipe calls for ingredients in grams and the next recipe calls for ingredients in ounces? Well with this food scale, that won't be a problem. The dual reading dial on the Salter 125 displays your weights in both grams and ounces simultaneously...you'll never have to worry about switching back and forth between units again. 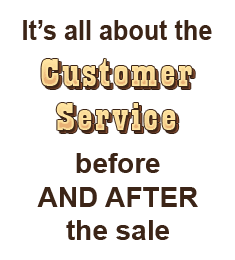 5 YEAR MANUFACTURER'S WARRANTY! 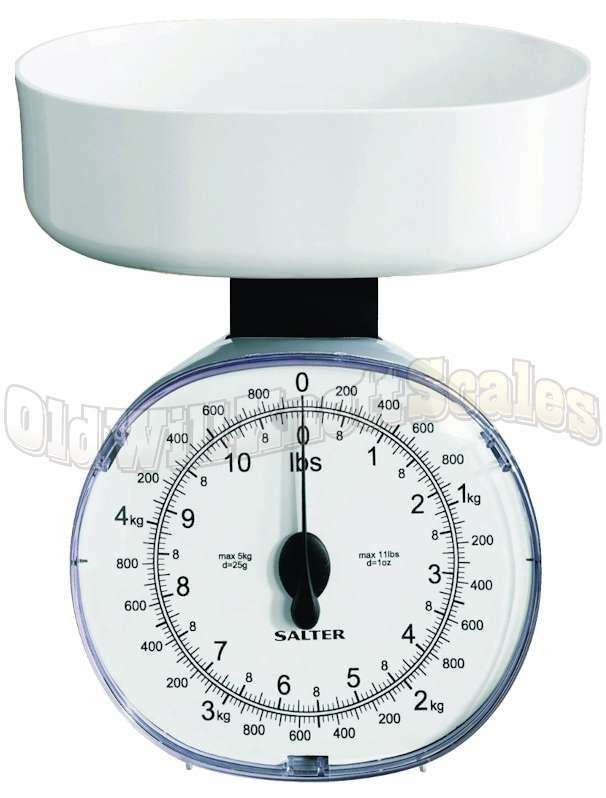 Salter provides a five year warranty on this kitchen scale, so if ya have a problem with your 125 send it in to the Salter warranty center. They'll get a replacement sent right back to ya. I used it and it works good. Thanx! Very pleased with my selection...it is the perfect scale for kitchen use during canning season. Ordered the scale and two days later it was at my door...exceptional service. Seems to be great. Sure as heck beats that digital thing I had been using (and I'm an old fart that seems to live on a computer; industrial appraiser). Give me the tried and true technology; simple to use, easy to adjust, looks like it can take a reasonable amount of abuse. Does what I want it to do, does it the way I want it to, and does it with a minimal amount of bother. I think this mechanical is enough for me...I am not concerned about a few ounces one way ort the other...we have used this scale for years to sell produce on our front porch...would love a larger scale with a larger capacity bowl...I see people have a time weighing 4 pounds of peaches, cherries, etc. all at once. I think this mechanical is enough for me...I am not concerned about a few ounces one way ort the other...we have used this scale for years to sell produce on our front porch...would love a larger scale with a larger capacity...I see people have a time weighing 4 pounds of peaches, cherries, etc. The kitchen scale arrived quickly and well packed. It is a beautifully crafted item, and is larger than the one I had before, and takes heavier and bigger items, as well as smaller ones. I would definitely recommend this company for anyone looking for a scale. I am so pleased with this scale. It is the perfect size - love all the features especially the removable weighing container and the tare feature. It's so easy to read. It was exactly what I was looking for. And I might add it was a smooth transaction and speedy delivery. Thank you.